Tender slices of garlicky roasted portobello mushrooms and protein-packed lentils swimming in a flavorful green pea basil pesto sauce. Vegan. I had this delicious dish for dinner when we were on our Disney cruise honeymoon last month. I couldn’t believe the texture of the roasted portobello mushrooms, it was so meat-like. I had to double check the menu to make sure that my vegan dinner wasn’t really sliced chicken or pork! Nope, it was definitely a portobello mushroom. Delicious, garlicky, perfectly-cooked roasted portobello mushrooms sitting on top of a mountain of lentils surrounded by a moat of pea pesto sauce. It was so darn good. I knew that I had to try recreating it once I got home. Recreate it, I sure did! Starting the day with a flavorful quinoa breakfast bowl that’s loaded with eggs (or a tofu scramble) and sauteed spinach will kickstart your booty into high gear! Gluten-free + vegan-friendly options. During the week, Travis usually skips breakfast because he’s not hungry that early and I eat a light breakfast while I watch the news in the mornings. I rotate between avocado toast, a tofu scramble, or mango cherry chia seed pudding cups. On the weekend, I like to make something a little more special like these quinoa breakfast bowls! 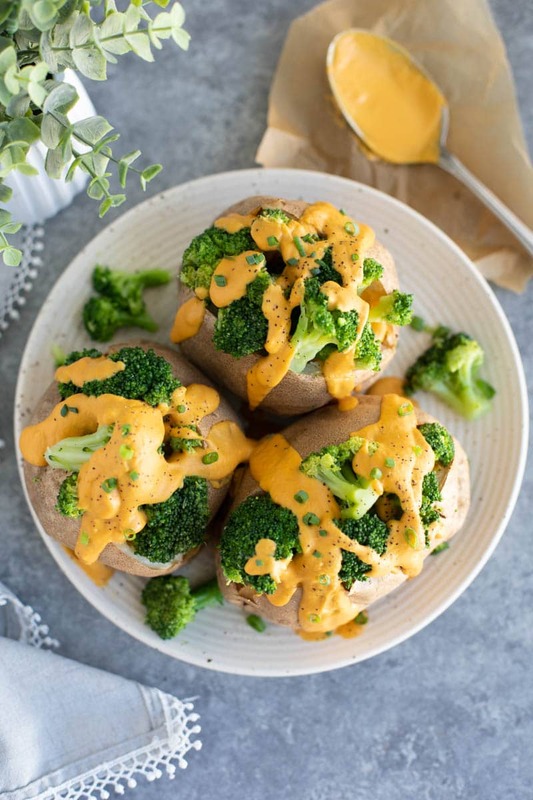 The only way to make baked purple sweet potatoes anymore delicious is to stuff them with roasted garlic broccoli and the creamiest vegan cheese sauce! Dairy-free and gluten-free. Potatoes stuffed with broccoli and drenched in ooey-gooey cheese sauce was one of my favorite meals when I was little. I would request less broccoli and more cheese, please! I don’t think that ever happened but I still tried. My mom aways made us very healthy dinners, so, cheesy broccoli stuffed potatoes were more of a treat meal on special nights when we got to request something for dinner. Like, if we got a good grade on a test or did something extra nice for someone. Old school cheesy broccoli stuffed potatoes aren’t exactly the healthiest meal but I still loved it. Now, that I’m a vegetarian trying to transition to being a full time vegan, I have to come up with replacements for certain things that I used to love aka cheese.